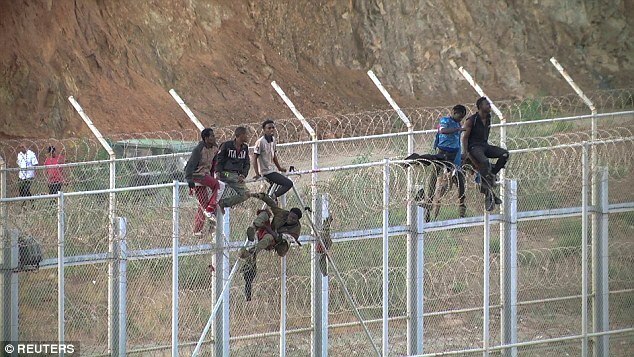 Over 600 African migrants reached the Spanish North African exclave of Ceuta on Thursday after storming the heavily fortified border fence separating the Spanish territory from Morocco. Around 800 migrants tried to force entry into Ceuta at dawn but some of them were stopped by Moroccan police. This is the biggest attempt to force entry in Ceuta since February 2017, when more than 850 migrants entered the Spanish territory over four days. The migrants used circular saws, shears and mallets to cut through the wire. They hurled plastic bottles of excrement and quicklime, a skin irritant, and makeshift flamethrowers to deter police from intervening. The Spanish Red Cross said in a tweet that 132 migrants were hurt in the mass charge. Some policemen also sustained injuries. The incident further increases pressure on Spain which has seen a surge in migrant arrivals by sea in recent years. In the past few weeks itself, favourable weather in the Strait of Gibraltar, the narrowest passage of the Mediterranean Sea separating Spain from Morocco, has prompted more and more migrants to undertake the perilous sea journey. Spain's Maritime Rescue Service said it picked up 332 people in the Mediterranean on Thursday. On Wednesday, it rescued 424 people. Illegal arrivals by sea have more than doubled from last year to almost 17,000 so far this year, according to Interior Ministry data. The arrivals have strained services in some towns in southern Spain. The dramatic increase in migrant arrivals is also a result of Italy — the busiest gateway for migrants arriving in Europe via the Mediterranean — putting in place aggressive measures to stem migrant arrivals on its shores.